Dr Dalvir Chauhan, MBBS, MS & MCh(Ortho), with an illustrious experience of 15 years, is currently the Director of Orthopaedics Department at Alchemist Multi-Specialty Hospital, Panchkula. 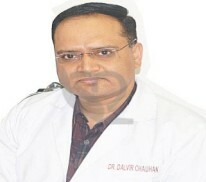 Prior to that, he had distinguished career stints as a Consultant Orthopaedics & Joint Replacement Surgeon at Silver Oak Multispecialty hospital, Mohali; Orthopaedics Consultant at Fortis Hospital, Jaipur and Senior Resident Scholar in Orthopaedics Department of Government Medical College & Hospital Chandigarh. Dr Dalvir Chauhan completed his MS (Ortho) from the renowned Sardar Patel Medical College, Jaipur and MCh (Ortho) from University of Seychelles’ American Institute of Medicine. Then he attained expert training in advanced joint replacement & arthroscopic surgery from GMCH and USAIM. Dorsal & Lumbar Spine for various traumatic, degenerative, infective pathologies along with Endoscopic discectomy of lumbar spine. To Dr Chauhan’s credit, he is one of the few surgeons in the Northern region who has been managing Paediatrics Orthopaedics procedures like CTEV correction by soft tissue & bony procedures, Operative treatment of Congenital Hernia, Deformity correction and Paediatric trauma from last 15 years with equal ease.